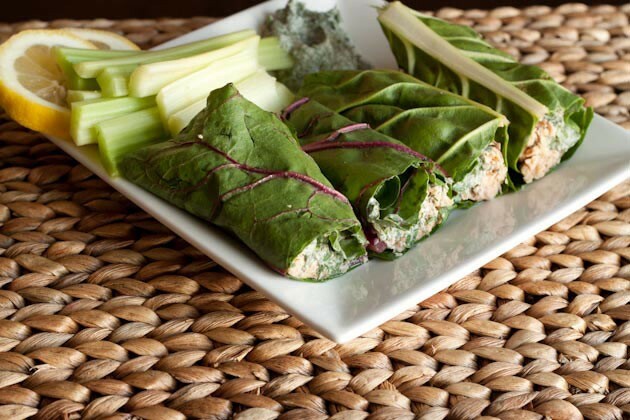 These wraps make for a light meal high in protein, vitamin K, and phytonutrients. Place coconut milk, green onions, dill, lemon juice, and herbamare in a blender and blend until smooth. Place tuna in a small bowl, combine with 1/2 the sauce, and sprinkle with pepper. 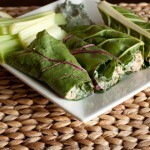 Divide the tuna mix and place on each leaf. Roll the leaf tightly [be gentle!] and cut down the middle. Place on a plate with extra lemon, remaining sauce + veggie sticks.